Former War Veterans minister Tshinga Dube will go down in history as the only member of President Robert Mugabe’s Cabinet who publicly told him to consider stepping down due to old age. Dube paid a heavy price for his daring remarks where he also warned the 93-year-old that he faced a humiliating exit if he did not take calls to name a successor when he still could. He was fired in Mugabe’s last Cabinet reshuffle. On Friday, he sat side by side with war veterans’ leader Christopher Mutsvangwa at a press conference where they announced plans for a final push against the beleaguered president. Dube told Standard reporter Blessed Mhlanga (BM) in an interview that Mugabe had ignored a seven-day ultimatum by Zimbabwe Defence Forces commander Constantino Chiwenga to reverse the purging of Zanu PF members believed to be supporters of ousted vice-president Emmerson Mnangagwa. The Makokoba MP and former respected Zipra commander said Mugabe’s defiance triggered the army takeover last Wednesday. BM: You have been a cabinet minister working with Mugabe and you were close to him. People are saying he is incompetent. How was he when he chaired cabinet meetings? TD: I can’t say much; well, he came to Cabinet meetings. He presented himself, yes, but what he grasped from the meetings I don’t know. 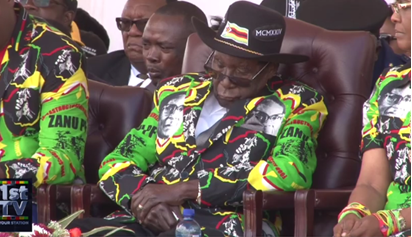 However, most times [former]vice-president Emmerson Mnangagwa was chairing Cabinet meetings, while he [Mugabe] was just sleeping. BM: Mugabe and his wife Grace insulted all who dared cross their path. Why did you allow this to happen for such a long time? TD: You don’t usually rush to solve things, you let a man have a very long rope to hang himself and finally he has hung himself. He is cornered with nobody feeling sorry for him or even wanting anything to do with him. BM: You shared trenches with Mugabe and you have spoken highly of him in the past. Do you feel sorry his legacy is now tattered like this? TD: It’s his choice. if he can still save it by being reasonable saying “I am stepping down”, then we will discuss with him and see what’s next and we give him some form of respect. But if he refuses then he is arrogant and that is what the people of Zimbabwe will have to deal with. In that option, he will walk away with nothing. He will be forgettable in the history of Zimbabwe and that will be sad for both him and his family. BM: You have always been outspoken and said things that Mugabe did not want to hear, which saw you being fired. What gave you that courage at a time when everyone in government and Zanu PF feared him so much? TD: Oh well, it’s an individual character. If you want to become a coward and can’t talk at my age [it becomes a problem.] I say what I think, otherwise I would not have been normal not to speak out on an important national matter that affects the people I serve as a member of parliament and as I served as minister. BM: After this action by the military, which nobody is calling a coup, what do you think the future holds for Zimbabwe? TD: The future of Zimbabwe is going to be very bright; already we are starting next year on a very high note, one without a family dynasty. This brings lot of hope and vigour to our people. We want our people to enjoy Christmas and make a life for the young people. BM: There are calls for Mugabe to step down because of old age, are you also considering stepping down from politics after all this is done? TD: As long as I am still healthy, I must participate in the running of the country. I must be involved in shaping the future of our people. BM: What are your views on the action taken by the Zimbabwe Defence Forces to put pressure on Mugabe to resign? TD: It shows maturity of the forces, love for the people of Zimbabwe, and a dedication to the people’s welfare because they have done exactly what they are supposed to do; they have not done anything out of their mandate. They didn’t carry out a coup but just swept the house so that they leave it clean. BM: Did it have to come to this? Were there any attempts to make Mugabe understand that he needed to go before the military action? TD: Well, he was given an ultimatum before this started, before General Constantino Chiwenga went to China. He was given an ultimatum and he chose to ignore it. BM: What was the nature of that ultimatum? TD: The ultimatum was the same as the statement that was eventually read out by the generals before they stepped in. They told him to sort out his mess within seven days, to gag his wife and deal with the G40 cabal, which was busy insulting the person of the military and leaders in government in public spaces. He didn’t. Instead, they went on a spree of expelling people from the party, quite the opposite of the ultimatum. BM: Was this after Mnangagwa was fired or not? TD: Vice-president Mnangagwa was only fired after the ultimatum and he was moving to fire more than 100 party members, most of them war veterans. Then from there they wanted to purge out government employees. BM: What was the objective of the purges in your view?